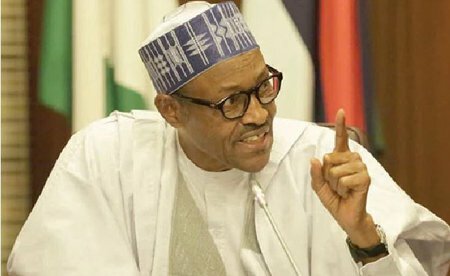 President Muhammadu Buhari has challenged those who want to contest against him in 2019 to an integrity test. Speaking at an interactive session with community leaders and stakeholders at the Coronation Hall of the Kano Government House to round off his two-day visit to the state, he said Nigerians would not let treasury looters return to power. He said: “Those who ruled Nigeria without vision and looted the nation’s treasury are the same people boasting that they will displace the APC government and return to office. The President cautioned the opposition to be ready to respond to questions from Nigerians on how they governed for 16 years without genuine development. The opposition Peoples Democratic Party (PDP) says it will be returning to power in 2019 because, in its view, the APC is not doing well. He lamented that “corruption and corrupt practices have assumed a frightening dimension” and explained that “the fight against corruption is the most difficult task of the present administration’s agenda since its inception over two year ago”. All the property recovered from treasury looters will be sold off and the proceeds remitted to the Federal Government’s coffers for use to provide the good things of life for Nigerians, he said. Selling off the properties would serve as deterrent to politicians who want to steal, the President added. Giving reasons for his thinking, Buhari said it was to avoid the mistake he made as a military ruler when the stolen assets he confiscated were returned to the owners after he left office. President Buhari thanked Kano people for their warm reception and promised to play a part in the state’s development. He called for the review of the Economic Community of West African States (ECOWAS) charter, saying the liberalisation agreement of cross-border trade does not favour Nigeria as massive smuggling of sub-standard products, such as rice, textile materials and beverages have continued to kill the nation’s economy. Stakeholders of the All Progressives Congress (APC) in the state adopted the President as their candidate for the 2019 general elections. They also expressed their commitment and support for Governor Abdullahi Ganduje as their candidate for 2019. According to a statement by the Senior Special Assistant on Media and Publicity, Garba Shehu, the President did not say he accepted and did not decline the endorsement even after the party leaders promised to procure the nomination forms for him and threatened to sue him if he declined. The APC stakeholders meeting was attended by Governor Ganduje, his deputy Prof Hafizu Abubakar, the state Chairman and the members of the State Executive Committee and members of the National Executive Committee of the party from Kano State. Also present were two of the state’s senators; members of the House of Representatives from the state, the Speaker and 34 of the 40 members of the Kano State House of Assembly and the 44 party chairmen, their deputies and the Local Government Area secretaries of the APC. It was witnessed by Jigawa State Governor Muhammed Badaru Abubakar. The state chairman of the APC, Alhaji Inuwa Abbas hinged their endorsement of the President on his achievements in the last two years especially on security, the war against corruption and the restructuring of the economy. Speaking on a humorous note, Ganduje said the party was prepared to drag the President to court to force his acceptance of the second term ticket. Buhari said he understood the clamour by the ordinary people on the streets who raised four fingers on each arm, ”meaning four-plus-four”.